Inheriting his slighted forefathers' bitter hatred for Queen Victoria, Nigel Whitaker has finally found a way to punish the Queen: kidnap her great-grandson David, "the apple of her eye," and whisk him off to America. But when fortune-seeking emigrants Jeremy and Cecelia Barlow, unable to have children of their own after a riding accident, become attached to the adorable child, his fate is even more uncertain. Meanwhile back in England, Queen Victoria's grace and her faith in Christ are working changes in the heart of Nigel's secret accomplice. The Lacys weave another complex plot line involving America's early immigrants and revealing the all-knowing power of God. 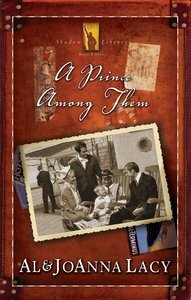 About "A Prince Among Them (#03 in Shadow Of Liberty Series)"
Handsome, accomplished Dr. Erik Linden veers between heroism and accolades/ failure and despair in this fascinating new historical novel. A recent medical graduate in nineteenth-century Switzerland, Erik finds himself in a crisis of faith after his former fiancee dies on his operating table. Should he give up performing surgery? Should he abandon his homeland and seek a better life in a freer place? Meanwhile, lovely young Dova, a friend in Erik's hometown, faces murderous avengers after identifying them to the authorities, even as she struggles with an affection that she must keep quiet. As the two young people cope with love's longings on opposite shores, can they find the serenity of God's covering in The Secret Place?